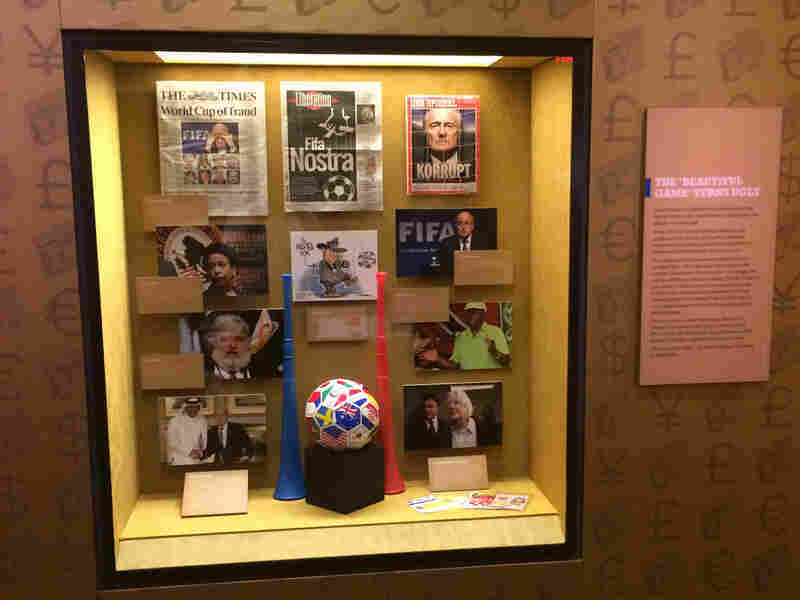 Mob Museum Unveils FIFA Corruption Exhibit : The Two-Way A new exhibit about FIFA's recent corruption is on display at the Las Vegas museum of contemporary organized crime. The Mob Museum's new exhibit highlights the "rampant corruption that plagues" the world soccer governing body, FIFA. It opened Tuesday. Take a trip to The Mob Museum in Las Vegas and you'll find exhibits on gangsters, corruption, killers, crime bosses, drug traffickers — and, now, the international governing body of soccer. Tuesday, the much maligned FIFA Congress finds itself alongside the likes of the Mafia and drug cartels, thanks to the opening of a new, temporary exhibit called "The 'Beautiful Game' Turns Ugly." "This is good, old-fashioned corruption," the museum's director of content, Geoff Schumacher, said of FIFA's operations that resulted in the May indictment of 14 officials. "Organized crime has always thrived on corruption: bribes, kickbacks and influence that get you what you want." According to a press release about the exhibit, the aim is to provide "a breakdown of the kickbacks, secrecy and match-fixing" that led to the charges against the FIFA officials. "While allegations of corruption have been made about FIFA for more than a decade, its activities were finally confirmed by U.S. FIFA representative Chuck Blazer in 2013. Blazer admitted to taking bribes to ensure South Africa would host the 2010 World Cup and agreed to wear a wire to record FIFA conversations. As a result of his cooperation, a May 2015 indictment by new U.S. Attorney General Loretta Lynch charged 14 top-ranking soccer officials and sports marketing executives with taking more than $150 million in bribes and kickbacks over 25 years." Schumacher told NPR that the museum, also called the National Museum of Organized Crime and Law Enforcement, began planning the exhibit following the May 27 announcement of the indictments. "There was such big media coverage," says Schumacher. "But it was also very quick to tie the FIFA scandal into organized crime, and we recognized that immediately as an opportunity for us." Schumacher says the museum also considered the exhibit's appeal for international visitors. "Soccer is growing as a sport in the United States but it is the thing in the rest of the world, so this FIFA scandal is always front page news." The exhibit, which comprises photographs, media clippings and cover stories, is the first in what the museum envisions as a series on contemporary organized crime. "One of the things we are interested in doing is using it as an educational tool to talk about what organized crime looks like today versus 30, 50, 100 years ago," Schumacher said. "It is a history museum. But in the old days when people wore fedoras and carried tommy guns, that's not how it looks today." So what's next in the series? "We think the next exhibit will be on the El Chapo prison escape in Mexico," Schumacher said.